Posted on Wed, Feb 1, 2012 : 2:59 p.m.
A rendering of the 618 South Main apartment complex, which is proposed for the former Fox Tent & Awning site near downtown Ann Arbor. 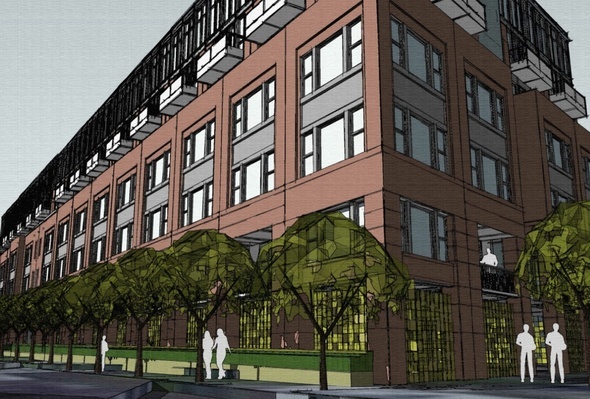 The Ann Arbor Downtown Development Authority will consider a proposal to reimburse nearly $3 million in tax revenue to the 618 South Main apartment project. Representatives of the proposed eight-story apartment building asked the DDA to consider reimbursing the developer $2.3 million for elements of the project - including utility upgrades, LEED certification, solar panels and a rain garden project - as well as $400,000 toward additional streetscape work the DDA normally would fund. Project developer Dan Ketelaar of Ann Arbor-based Urban Group Development Co told the DDA that when the $25 million project is complete, the building will generate about $500,000 per year in tax revenue. Ketelaar said nearly half of that would go to the DDA, since the project - between Madison and Mosley - is within its boundaries. Ketelaar said elements of his request normally would be funded by the DDA, but his company will front the cost and accept a reimbursement over time. He is asking for $1 million of the eligible expenses, and the cost of the streetscape project, six months after a certificate of occupancy is issued for the building. The additional amount would be reimbursed over time as the DDA collects the tax revenue generated from the site. The project is estimated to bring in more than $4 million to the DDA over the next 15 years, Ketelaar said. The 618 South Main streetscape is along Main Street, from Mosley to just south of William. Improvements such as expanding the walkways, street updates and an aesthetic overhaul of the street are planned. The DDA will review the request and make a decision at an upcoming meeting. Thu, Feb 2, 2012 : 12:26 p.m. The DDA should keep in mind what happened to Ashley Terrace and a couple of other pricey projects that recently failed. How about helping small businesses that can diversify downtown's retail base? A little can go a long way. Thu, Feb 2, 2012 : 5:18 a.m.
Hey, Looks like they are just trying to get some of the required payment back (if they don't put in a percentage of &quot;affordable housing units). And of course there will be a few more utility connection fees along with permits etc.. Wonder how much the City is getting in tax income from the property that is now on the site? Maybe the DDA could ask for some of the Public Art funds to be used in making the Steetscape look a bit better than the present fence and parking lot ! How about some creek rocks along the curb to create a soothing sound every time it rains? We should be able to find some Swiss design group to come up with a nice artistic piece which will look fantastic right across the street from a Car Wash.
Thu, Feb 2, 2012 : 1:18 a.m.
Government and profit minded development- what could go wrong? To be sure let's guarantee the project with unfunded obligations for our grandchildren. Ketelaar says, &quot;streetscapes and green incentive projects are usually funded directly by the DDA&quot;. I'm thinking that in the case of a developer who is improving a building to attract quality tenants and will profit handsomely from the 25 million dollar investment, should be required to fund all the &quot;improvements&quot;. I urge the DDA to not squander our tax dollars to generate additional profits for developers. This is a bad deal for Ann Arbor taxpayers. Wed, Feb 1, 2012 : 11:33 p.m.
Close down DDA and let all the tax revenue from this property go to the City of Ann Arbor where it belongs. Wed, Feb 1, 2012 : 11:06 p.m. I can see giving tax relief to a company that is investing capital in their business that will directly create jobs. But tax relief for a real estate venture? Seriously. And why do people have such a dim view of developers in this town? Oh and by the way DDA/City of Ann arbor: I'll be waiting for my tax relief for fixing my, er, your sidewalks two summers ago. You can just phase it in over the next few years since I fronted the money. Think of how my increased taxes (because of my improved sidewalks) benefits everyone. Wed, Feb 1, 2012 : 9:41 p.m. I suppose this was in the works from the get-go and part of the reason it was approved in the first place. But then again, I no longer care what happens inside city limits. Wed, Feb 1, 2012 : 9:11 p.m. The developer should not be asking for a bailout, nor should the Downtown Development Authority be even thinking about granting such a request. This is taxpayer money that should be used for us. The DDA has way too much power over city council, and now it wants even more. Citizens say no! Wed, Feb 1, 2012 : 9:07 p.m.
Tax money should not go toward private development. This is the first signal that the Projects numbers do not &quot;crunch&quot;. Wed, Feb 1, 2012 : 8:44 p.m. Ask for the moon. Hope for anything. Expect nothing! Wed, Feb 1, 2012 : 8:38 p.m. The other shoe has dropped. I will be writing to my ward rep on city council. This really burns me up. No tax breaks for developers! Give residents tax breaks, or at least give us basic services. Wed, Feb 1, 2012 : 8:27 p.m.
Council member Mike Anglin has talked about reducing Main Street by this project from 4 lanes of traffic down to 1 lane each way with a turn lane. This will make driving even more difficult. I hope the DDA will not fund this. If you are opposed to this reducing of streets in town and making traffic even worse than it already is, contact your council member and voice your objection. Thu, Feb 2, 2012 : 1:21 a.m. Wed, Feb 1, 2012 : 8:48 p.m.
Main street is already one lane two blocks from there. I seriously doubt this will make driving &quot;even more difficult.&quot; Removing a lane in each direction to provide for a center turn lane seems like a reasonable idea - right now people dart between the left and right lanes to try and avoid cars that are stopped to turn. That strikes me as more dangerous and likely to create more sudden stop and go situations than a single lane of unimpeded traffic. Of course, my opinion is like yours, just an opinion. It would be nice to see some measurement of this plan from other cities who've gone from 2 lanes to 1 with a center turn on their roads. I know Austin has done so on a bunch of roads around UT in the past 5 years.